A new year, a new start and many of us are striving to improve ourselves; whether this means becoming less argumentative or making sure to donate to charity. Unsurprisingly, supreme leader of North Korea, Kim Jong-un, has chosen a decidedly different tact. 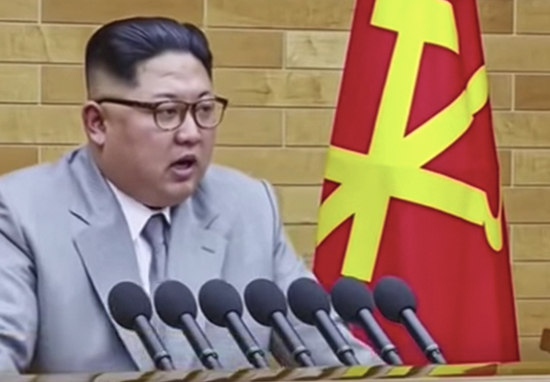 Rather than pledging to take up pottery or ring his grandma up on the regular, Kim has stuck with his long-standing interest in terrifying the world with his nuclear ambitions. Kim Jong-un is trending on New Years Eve…this can't be good, can it??? The dictator dropped major hints about potentially sending athletes over to compete in next month’s Winter Olympic Games in Pyeongchang, South Korea. The chairman even suggested he would send over a delegation to the games and said he may be up for talking over the details with his Seoul counterparts. As you are undoubtedly aware, Kim and US President Donald Trump aren’t exactly on sleepover party terms. Their Twitter duals alone have been one of the more worrying aspects of what was – let’s face it – a deeply concerning year – it’s clear Kim wasn’t about to let Donald have the final word. The entire mainland of the US is within the range of our nuclear weapons and the nuclear button is always on the desk of my office. They should accurately be aware that this is not a threat but a reality. No matter how much America wants to attack us with their military might and nuclear power, they know that now we possess such great nuclear power and therefore they will not dare. I hope he has careful cleaning staff. As speeches go, it doesn’t exactly have the inspirational qualities of Martin Luther King Jr.’s I Have A Dream. To be honest, the sight of the hipster-haired despot spewing yet more hate and fear doesn’t exactly fill me with great hopes for a peaceful 2018. Kim would not hesitate to hold the whole globe hostage with its nuclear threats, while at the same time speaking of peace through inter-Korean talks and wishing the best for the Pyeongchang games. It is a shallow charm offensive. President Moon Jae-in must stop begging Pyongyang for talks and face the truth.